Objective: Surgical recovery, the “return to normal physical well-being, social, and economic usefulness, and psychological habitus”, is a process that should be measured using multidimensional outcomes that are patient-centered. 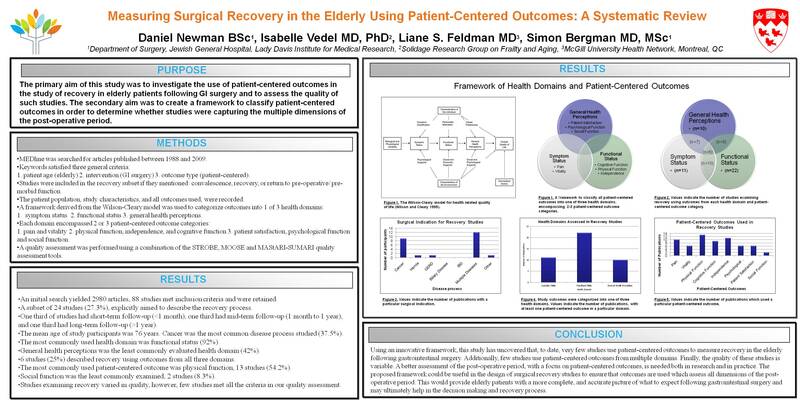 The primary aim of this study was to determine how patient-centered outcomes are being used in the scientific literature to measure recovery, in the elderly, following gastrointestinal surgery. Methods: The database MEDline was searched for articles published between 1988 and 2009, using several keywords to satisfy three general criteria: patient age (elderly), intervention (gastrointestinal surgery), and outcome type (patient-centered). All selected articles were independently reviewed by two researchers. The patient population and study characteristics, as well as all outcomes used, were recorded. 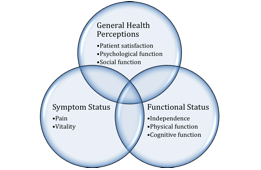 A framework derived from the Wilson-Cleary Model for Health Related Quality of Life was used to categorize patient–centered outcomes into one of three health domains: symptom status, functional status, or general health perceptions. In turn, these health domains encompass 8 outcome types: pain, vitality, patient satisfaction, psychological function, social function, physical function, independence, and cognitive function (figure). Results: An initial search yielded 2980 articles. Eighty-eight studies measuring patient-centered outcomes in the elderly following gastrointestinal surgery were retained. The analysis involves 24 studies which explicitly aimed to describe the recovery process. In this subset, the majority of studies (83%) were published after 1998, 83% were prospective, and 17% were retrospective. One third of studies had short-term follow-up (<1 month), one third had mid-term follow-up (1 month to 1 year), and one third had long-term follow-up (>1 year). The mean age of study participants was 76 years. Cancer was the most common disease process studied (37%). Applying the proposed framework, the study shows that eleven (46%) studies measured symptom status outcomes, 21 (88%) measured functional status outcomes, and 9 (38%) measured general heath perceptions outcomes. Twelve (50%) studies used an outcome from at least two domains, while only 5 (21%) studies described recovery using outcomes from all three domains. Conclusions: Using an innovative framework, this study has uncovered that, to date, surgical recovery in the elderly has been sparsely studied: only 27% of studies examining this patient population, in the context of gastrointestinal surgery, measured recovery using patient-centered outcomes. Furthermore, only a small number of these studies (21%) measured recovery using outcomes from all three health domains. A better assessment of the recovery process, with a focus on patient-centered outcomes, is needed both in research and in practice. The proposed framework could be useful in the design of surgical recovery studies.